This is Address was delivered at the College Evening, September 8, 2006. 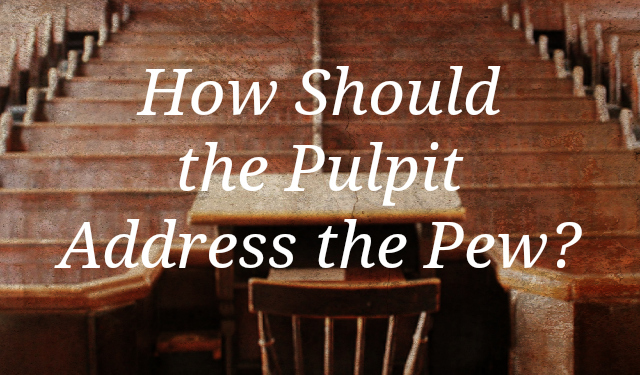 Just how should the person on the pulpit view those who are in the pew? This question appears to be very much of concern today. I am thinking about a remark in a very recent issue of Clarion in which we were told that there is this longstanding belief among the Free Reformed that Canadian Reformed ministers really do not understand what an experiential, discriminating ministry should be (Vol. 55, No. 17, p. 403). I am thinking also of the accusation often directed at our federation to the effect that we, who have rejected Kuyper’s presumptive regeneration, seem to have let it back in through the backdoor because of the way in which we view our children. I am also thinking of the fact that we have several young people before us who will face this challenge in their future ministries: how should they view those who assemble week after week under the preaching of the Word? There are many approaches to preaching, but I would like to suggest this evening that it is possible to build an approach out of an understanding of who the audience is. It’s quite straightforward. If we view them all as condemned and hardened in sin, that will bring about a certain kind of preaching. Conversely, if we view them all as saved and safe, that will determine the content and the tenor of preaching as well. Some of you will realize that, for some time now, I have been working on Romans 4 as a test of modern approaches to New Testament studies. My family in fact would tell you that I have been working on this too long. But that’s just the nature of dissertation work. In any case, while working on the last part of Romans 4, I became deeply impressed how, in this chapter which is really all about justification by faith for Jew and Gentile, Abraham is utterly convinced that whereas he is unable, God is able. Faith for Abraham is entirely a matter of believing in the promises of God, believing in the power of the God who is able to do what he is not able to do. Abraham, Paul says, knew that both his body and Sarah’s womb were “as good as dead;” “Yet,” says Paul, “he did not waver through unbelief regarding the promise of God, but was strengthened in his faith and gave glory to God, being fully persuaded that God had power to do what he had promised. This is why it was credited to him as righteousness” (Rom 4:20-22). Clearly faith is embracing the promises and the power of God. This is a very significant point, since Abraham is the father of all believers, Jews and Gentiles, according to Paul. The one answer for all the people of God is to “walk in the footsteps of the faith that our father Abraham had…” (Rom 4:12). Living in the disposition of faith, embracing God throughout our lives is what the Christian life is all about.What strikes us about Abraham is that it is not Abraham, but it is God who does everything. And that seems to me to be what we need to lay hold of. My point is that in the writings of Paul, we have a model as to how a minister ought to view his congregation. Every service is like a letter of Paul, or any of the other apostles for that matter. We begin most of our services with what? Words from the beginning of 1 Corinthians: “Grace and peace to you from God our Father and our Lord Jesus Christ” (1 Cor 1:2).We end our worship services with what? Words from the end of Paul’s second letter to the Corinthians: “May the grace of the Lord Jesus Christ, and the love of God, and the fellowship of the Holy Spirit be with you all” (2 Cor 13:14). How do we begin our sermons? With the address: “Beloved congregation of our Lord Jesus Christ.” But are we sufficiently aware as we preach that this is whom we are addressing? Sermons are not an address to potential members of the congregation. Sermons are not an address to the part of the congregation that we think believes. They are an address, a proclamation, to the congregation that has professed and does profess God as God, Jesus as Saviour and Lord, by the power of the Holy Spirit. Now, consider: how does Paul speak to that congregation? I suspect that if one of us would be pastoring a church that had all the problems the Corinthians had, we would be addressing that question: do you believe or do you not? Are you part of the Christian community or are you not? We would be issuing our calls for faith and repentance. But strikingly, that is not Paul’s approach. He begins this letter, “I always thank God for you because of. . .” (1 Cor 1:4). And he, very pastorally, urges them to depart from their divisiveness (ch. 1), to expel the hardened sinner (ch. 5), to settle their differences internally (ch. 6), and so forth. That, by the way, is a pattern throughout all of his letters. Embracing the positive, appreciating how they are a new body in Jesus Christ, and acknowledging the presence of the work of the Spirit who continues to renew the churches and all those who believe. You see, there is an approach to preaching that focuses again and again on the manner in which we enter the family of God. It is busy, you could say, with the doorway into that family. Questions of election, and faith, and experience, and whether you belong, receive ample attention. And I do not deny that those questions need to be dealt with now and then, especially when the text calls for it. Paul does that too: Romans 4, Galatians 3. But, for Paul, it is not always about that. He’s not busy so much with what it takes to get into this family, but he is busy again and again with the question: what does it look like to belong to this family? What do its family members look like? He’s busy with the question: are we living out of Christ Jesus? By the power of the Holy Spirit? And why does Paul follow this approach? Because he truly does see them in Christ and as congregation of Christ. One can think in this regard of Paul’s words in 1 Corinthians 1:30, where he speaks about our Lord Jesus Christ “who has become for us wisdom from God – that is, our righteousness, holiness, and redemption.” Rather than upbraiding them for their lack of faith, he attempts to persuade them that despite their lowly calling, they already possess true wisdom in Christ Jesus, and he defines that wisdom in terms of “righteousness, sanctification, and redemption.” It is not the age or creativity of human beings that constitutes wisdom. It is not Paul’s own eloquence that will make them wise. Wisdom is the work of God in Christ. Paul uses these three metaphors to try to explain the depth and the breadth of what the people of God are in Christ. Their righteousness is by faith in Jesus Christ. Their redemption is through the one Redeemer, Jesus Christ. But similarly, their holiness, by which he appears to mean first of all their positional holiness, their new status as sanctified believers, as holy congregation. Not unlike Israel, the new people of God are set aside in Christ and called to manifest their new lives daily until it is perfected on the day of the Lord. This is strikingly evident in 1 Corinthians 6, where Paul reminds the Corinthians of their former lives as sexual immoral, idolaters, adulterers, and the like. “That is what some of you were. But you were washed, you were sanctified, you were justified in the name of the Lord Jesus Christ and by the Spirit of our God” (1 Cor 6:11). Precisely because it is all from God in Christ by the Holy Spirit, therefore Paul is slow to suggest that their faith is not good enough, or their status is questionable, but he is constantly urging them by the power of the Holy Spirit to be what they are in Christ. It is again and again the imperative based on the indicative. Precisely because they are in Christ, they must live the life in Christ. Precisely because they are holy, they are to be holy. Precisely because they have been set free from sin, they are not to let sin reign over them. If Paul tells the people of God so emphatically in Romans 6 that they must consider themselves dead to sin and alive to God in Christ Jesus, should the preacher not help them to live out of that wonderful reality? The point is that everything is not said and done once we have come to the faith or once it has been verified in some way or the other that our faith is true.While we need of course this imputed righteousness of our Lord Jesus Christ, He who is our wisdom, our righteousness, and our sanctification also continues to work in us by His Spirit so that we are transformed persons, renewed beings who also fulfill the requirements of the law (cf. LD 32). It is striking that throughout Corinthians, the solutions to each problem, each challenge that the congregation faces, is answered by exploring for them what it means to be in Christ and to continue to be renewed by the work of the Spirit of Christ. Chapter 2 sets forth that methodology: his preaching is not just some eloquent and persuasive words; rather, it comes with “a demonstration of the Spirit’s power.” And chapter after chapter thereafter puts it into practice; the divisions of the church at Corinth are reprehensible because they divide Christ (1:13) and destroy the temple of the Holy Spirit (3:16, 17). The immoral man of chapter 5 is to be expelled because they really are congregation of Christ (5:7, 12). Lawsuits should not be happening among them because in Christ after all they are the saints who are to judge the world one day (6:2). Sexual immorality is off limits precisely because their bodies are “members of Christ” (6:15) and “temples of the Holy Spirit” ( 6:19). Questions about marriage and singleness are all dealt with on the basis of the fact that these persons all belong to the Lord (7:17, 32, 33, and 39). And that is how it goes throughout Paul’s letters. Every preacher would do well to read through Paul (or other New Testament writers) and consider whether he so addresses his people. It is true that these are letters, not sermons, but one who reads them carefully can have no doubt that Paul would so address God’s people in preaching as well. The principles are the same. They are not just in Adam; they are in Christ. They have everything in Christ. And so, blessings and growth and strength will come to them, not through human eloquence, not through force, the cunning of men, or whatever else; but in Christ, through the presence and the power of the Spirit. There is a tremendous dynamic about the life in Christ through the Spirit that we are often slow to consider. Precisely because the Lord Jesus Christ and the Holy Spirit are persons who live within us (1 Cor 3, Rom. 8:23), who grieve (Eph 4:30), and can be sorrowful and quenched (1 Thess 5:19), the person who is in Christ needs to be reminded of the challenges of this dynamic relationship. One can compare in this regard how Paul writes in his letters with how Paul preaches in the book of Acts. He is always what you could call, “audience sensitive.” At Lystra (14:8-18) and in Athens (17: 22-31) ) he has a completely different message than he does in Thessalonica (17:1-4) and Berea (17:10-15). Among the Jews, he will argue from out of the Old Testament Scriptures (18:4); among the Gentiles, he will argue from out of creation and providence (14:15- 18; 17: 22-31), declaring to them the content of Scripture; but among the Christians, he will remind them of the greatness of God’s work in Christ through his Spirit (20:18-35). And all of Paul’s letters are proof of the latter. So too, it seems to me, a preacher should be “audience-sensitive.” The congregation of Jesus Christ cannot be addressed in the same way as one would address a gathering of persons who are interested but do not (yet) believe. Even in a gathering where both groups are present, one cannot use the same “brush,” so to speak and address them in the same terms. To come back to that image of the doorway for a moment, it goes here somewhat in the same manner as it goes in the family. Parents are not always standing at the doorway, discussing with the children whether they are in or out, whether they belong or not. The children belong and they live in the security of their parents’ love. So too with the family of God. There are times when the call for faith and repentance will be heard clearly and forcefully also in this family. But at the same time, there is not this unending preoccupation with the question whether they are in or out. They have been embraced with the love of God. And they need to be shown time after time, Lord’s Day after Lord’s Day, what it means to be in Christ and to be renewed again and again by the Spirit of our Lord Jesus Christ. To be sure, if that does not resonate within them, they will move towards the door and office bearers will, so to speak, have a discussion again about those questions of faith and repentance and those discussions and appeals will have a passion about them. But that is not a weekly preoccupation in the family of God anymore than it is a weekly preoccupation in the family home. To put it frankly, to be sent out of church repeatedly on the Lord’s Day wondering whether I live on the brink of faith and unbelief because of what I see in myself is a discouraging way to live. But to leave the building with the conviction that God loves us in Christ and to be challenged to live then as we are in Christ by the power of the Spirit of God. . . that is uplifting and delightful. That is what we need. And that, I have no doubt, is Paul’s way. To put it somewhat more technically, one of our learned brothers has pointed to how the Canons of Dort, Chapter 2, Article 5, does not say that it is the call for faith and repentance that must be the focus of the preaching, but it is the promise of the gospel that ought to be proclaimed. “The promise of the gospel is that whoever believes in Christ crucified shall not perish but have eternal life. This promise ought to be announced and proclaimed universally and without discrimination to all peoples and to all men, to whom God in his good pleasure sends the gospel, together with the command to repent and believe.” And this is so precisely because the promise itself includes the powerful work of the Spirit, everything we need to believe and walk in faith. Dr. Hendriks goes on to point out that in the churches that see it differently, the preaching of the necessity of rebirth is wrongly placed between the preaching of the gospel promise and the congregation, and that leads to man-centeredness again.3 It is instead the promise of the gospel that must be preached and embraced; and that reminds me of that theme in Romans 4, about Abraham who embraces the promise that comes from the God who can do and will do what he cannot do ((4:13, 14, 16, and 20)! To be sure, all of this does not exclude our children and our young people. While they surely need to be reminded of the need to walk in faith, embracing the promises of God, Paul recognizes that they possess this sanctification, this positional holiness in Christ (1 Cor 7), and in Ephesians 6 (v.1, 4; cf. 1:1), he addresses them too as members of the church. Covenant children are not in the community because they believe, but precisely because they are in, they need to believe and grow up into maturity into Christ by the power of his Spirit. There is nothing automatic here. For children, for teens, for adults, faith and repentance are needed daily. But throughout all this we should continue to stand behind the classic words of the Form for Baptism: Just as our children “share without their knowledge in the condemnation of Adam, so are they, without their knowledge, received into grace in Christ.” To be sure, as they mature, there will be “doorway discussions” about faith and belonging; not however because they are outside, but precisely because they are inside the family and Christ and his Spirit “are promised to them no less than to adults” (LD 27). It has to do with the promise again! And that promise is not just about future realities4; it cuts into the present and offers them too strength and blessing as they walk in the ways of faith. This, it seems, is one significant solution to the redemptive-historical question. It is often difficult to know what a real redemptive-historical approach is in a sermon. This says it, does it not? Whatever the passage being dealt with, the minister is not speaking to the Israelites of David’s day (nor to the Philistines of David’s day!) or the Jews of Jesus’ day; he is speaking to a congregation that has been bought with the blood of Jesus Christ and struggles today to give glory to God. It is a solid antidote to moralism. Moralistic preaching, no doubt, will make people behave somewhat better. All ethical teaching, all promotion of religious values, whether they be Christian or Buddhist or whatever, will probably render some positive benefit. But it is the Lord Jesus Christ and the Spirit of God alone that softens hardened hearts and changes stubborn sinners into new creatures who are directed to God and his glory. Moralistic preaching will make bad people better; but real preaching in the strength of Christ and his Spirit makes dead people alive, old people new! When I, as a preacher, am not cognizant of these points, but just busy with admonitions of my own cunning and fine exegetical points that I might find, then I am relying on eloquence – what Paul warns against in 1 Corinthians. This is inadequate administration of the Word of God to the people of God, bought with his blood, filled with his Spirit. That seems to be the sense of what Paul means by the call to “examine yourselves” in 2 Corinthians 13. It is not a call to look for surety of faith in experience in and of itself. But it is a call to examine our hearts and lives as to whether we know of any evidence of this Christ and his Spirit dwelling in us. Does the gospel resonate in us? Is it making any difference? Imagine having a guest in your house and you pay no attention to him. Eventually, I think he will find the door and leave. So too, we have honoured guests living in us. Does that not come with tremendous challenges? But if we ignore them, what will the consequences be? You see, my struggle as a Christian – and I suspect yours – is not so much that I do not believe. It is: what does this faith look like? How do I live with these honoured guests in me? What are the daily challenges and consequences of our wonderful status in Christ? That is where the pulpit must come to the aid of the pew every time again. May the Lord bless all those who are called by Him to this tremendous task. 1 See e.g., Hendriks, “Experiential Preaching,” Diakonia (Volume II, Number 4; June 1989) 76. 2 Clarence Stam, though from a different angle, that of the covenant, makes some similar points in a chapter on “The Covenant and Preaching” in The Covenant of Love: Exploring our Relationship with God (Premier, 1999), 141-147. 4 On this, see C. Trimp, “The Promise of the Covenant: Some Observations,” Unity in Diversity: Studies Presented to Dr. Jelle Faber, (Premier, 1989) 71-77. Trimp also comments: “Should man refuse to accept God’s promise in faith, the validity of the promise yet remains; but the saving power of the promise is lost. The promise is aimed at faith and faith is closely connected to the promise” (77). 5 John Macarthur, “The Spirit of God and Expositor Preaching,” Rediscovering Expository Preaching (Word, 1992) 103. 6 C. Trimp, “A Resounding Gospel: Preaching and our Experience of Faith,” Diakonia Vol. 11, no 3, p. 82. See the whole chapter for a fine exposition of what experiential preaching is in the right sense of the word.